At some point in your life, you have probably made a New Year’s resolution. Maybe it was this year, and you set a goal to live your life differently in some way, big or small. You might already have abandoned your plans. Perhaps you have given up making resolutions because they so rarely succeed. It is hard to make big changes in your life, and you have to enter into that process expecting that you will experience a few setbacks. What separates the people who succeed at achieving their big-picture goals from those who do not is not that they never fail. It is in their response to failure. Everyone fails. Sometimes, you give in to temptation and do something you shouldn’t. Sometimes, despite your best efforts, other factors cause your best-laid plans to go awry. So, how can you learn from your failures rather than giving up? Here are five suggestions that come from my new book, Smart Change: Five Tools to Create New and Sustainable Habits in Yourself and Others. Often, the way you state your goals can get in the way of your success. When you are on the verge of giving up, look at what you set out to do. Did you set yourself a positive goal like eating healthier food or reading more books at work, or did you create a negative goal like eating less or avoiding distractions? Negative goals are almost always doomed to failure, for two reasons. First, when you are constantly trying to stop yourself from performing an action, you have to ride your mental brakes, using brain systems that are prone to weakening and giving out. Second, your habit-learning system does not learn from the experience of avoidance. 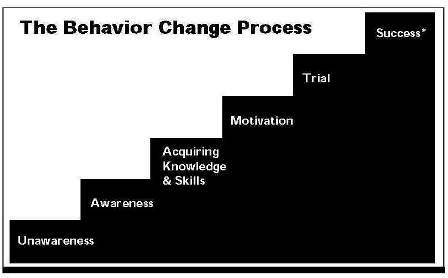 You generate habits when you perform an action that is related to an environment. You learn from doing. You do not learn when you don’t do something. So, even when you successfully resist temptation, you’re not training your mind and body to act a certain way. You have to reframe your goals to turn them into actions you perform rather than actions you are trying to avoid. There is a tendency for people to set up their goals in all-or-nothing terms. You may create a strict diet that you have to adhere to. You may go from being a couch potato to a daily exerciser. The problem with these all-or-nothing goals is that you are either succeeding or failing. In the case of a diet resolution, you are either sticking to the plan, or you have given up. Breaking the diet a little feels like failure, which can lead you to break it a lot. If you find that your small failures become catastrophic ones, then you need to think about whether you are creating too strict a boundary between right and wrong in your goals. Do you feel that small failures are just as bad as big ones? If so, you might consider seeing a little gray. Yes, it is bad to overeat a little, but better to admit you had a bad day and try to do better the next day than to go into a tailspin. When you fail, that means that something has gone wrong. You probably had some plan to achieve your goals, and on that day your plan did not work. As difficult as it can be to do so, you need to think through what went wrong and revise your plan so that the same thing does not happen again. The Federal Aviation Administration (FAA) allows pilots to send reports of any mistake they make while in a plane to a central database. The pilots are not punished for admitting their mistakes. The FAA then analyzes the mistakes to see if there are changes in procedures that need to be implemented. Air travel is safe because of this willingness to reset the plan. The same principle can be used to help you make your life better. One of the biggest sources of failure is the environment. It is hard to resist temptations in your world. The more you are forced to confront temptation, the more likely you are to give in. That means that you need to seize control of your environment and structure it to make the actions you want to take easy and the actions you don’t want to take difficult. If you find that you are spending too much time each day checking your email, then close your internet browser for a few hours a day. Consider removing the email app on your smart phone. Make it hard to do the actions you want to avoid, then, replace those actions with something else. Rather than checking your email compulsively, spend the time reading, writing or taking care of tasks at work. Rather than pulling your phone out every 10 minutes, spend time talking to people and looking around the world. Give your habit-learning system a fighting chance to learn new ways to engage with the world. Finally, remember that failure is not a sign of weakness. It is just a sign that changing your behavior is hard. When you realize that you have failed at something, you will feel bad at first. Give yourself a chance to experience the sadness or anxiety that may come along with a failure. Then, after a few hours (or perhaps a day), get back on the horse. Learn from the experience and move on. Remember that you forgive lots of people for their mistakes. Be sure to forgive yourself as well.